Back Pain Treatment and Causes. You are highly likely to require back pain treatment at some point in your life as 80% of the population get back pain regularly. But it doesn’t have to be that way! Below you will find a few of the common reasons we get back pain. Most back pain is caused by the facet joints of the spine becoming inflamed. The pain is typically sharp initially and has dull pain and stiff muscles associated with it. Turning in bed is usually difficult and getting up or down from a chair or in and out of a car. This is because the small facet joints at the back of the spine have become locked or overstretched and too mobile. Think of them as links in a bicycle chain, if some don’t move the next one will do too much work and become loose. 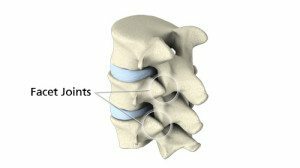 Why do we get facet joint syndrome? The commonest cause of this is an injury. Throughout your life you will have fallen many times, possibly had sporting injuries or even a car crash. This will cause some of your joints to get inflamed and lock up. If they stay stiff they can become stuck due to adhesions forming. This can lead to premature degeneration of the joints or put others under more stress as mentioned earlier. The irritation of the joints will lead to pain and a reactive muscle spasm and stiffness. This in turn causes more joint dysfunction and so on and so forth. The end result is that even a small incident can start a series of events that results in you stiffening up and aching. If this continues the discs can start to suffer (see sciatica) and that can lead to further problems for the facet joints. Stress can also increase your likelihood of developing pain and stiffness. Some people are born with vertebrae that are not perfectly formed or their spines are twisted and this leads to recurrent problems if left untreated. What Does facet syndrome feel like? Back and neck pain are the commonest symptoms of facet joint syndrome. Most facet problems are painfree until the joint becomes inflamed enough to cause pain. This can occur when doing daily activities such as picking something up or sitting down. Sometimes the nerves around the facet joint are affected. This causes pain that can travel through the nerves to give leg ache, arm pain, headaches or a feeling of heavy tired limbs and no energy or strength. If the problem is not corrected scar tissue can form and the joint can become very stiff and the cartilage surface can breakdown leading to arthritis. This may not actually cause pain though unless it becomes inflamed, so it is possible to have a lot of wear and tear but no pain and vice versa. No wear and tear but a lot of pain. Facet syndrome is a silent condition until it becomes inflamed. That is why it is a good idea to get yourself checked before you develop too many problems. If you have pain don’t live with it and accept it as normal, get some treatment for your low back pain. Ignoring your bodies warning signals can lead to a more substantial problem such as a slipped disc. You probably get your teeth checked once or twice or year even when they feel fine. When was the last time you had your spine checked?